After ten years as a Mountain Guide, my first work contract with La Sportiva came. An easy and difficult decision at the same time. Ninety years, such a long time, I can’t even measure it. Yet I have been connected to La Sportiva for more than a third of that time, almost thirty years and all of them are in my hands and feet. The power of climbing which has acted as a net, the weave of a fabric on which memories and the emotions of a lifetime have clung vertically. Emotions. The level which a climber’s soul gets used to and settles at is very high. Luckily those deep and contrasting emotions which were caught in my web were not one-directional. Looking back I see a climber whose senses where formed by the dimension of the mountain’s solitude and by an idea of climbing, which was based on ancient sentiments. The pleasure of knowing, of sharing, of the empathy enjoyed in the human world of the mountains was deep. I had the privilege of discovering rock at the beginning of the eighties, a period in which climbing came down from the mountains to the crags and was fed by its own enthusiasm, going towards dimensions which were still unknown. There were very few famous climbers, people of depth who had an important character, most of the time surrounded by a legendary and mysterious aura. After giving climbing a go, I remember that I seriously decided that I would be a climber in my life, the fire burning inside me was irrepressible. It was as strong as the pleasure of being up there and as much as the wish to become someone. I signed my first contract with a sponsor in 1987, it was with La Sportiva and the value of those three pairs of free climbing shoes went well beyond their worth in money. It meant being sponsored and furthermore by a company of which all the best climbers were part. My parents were so strict during the school year and so permissive during the summer holidays, that if my grades were good enough I was allowed to go climbing and all I needed was to give the names of the adults with I went climbing during the summer holidays and I was free to enjoy my dimension. I remember it as if it were yesterday. It was July ’88 and I had to reach some Roman friends at the Bardonecchia competitions. From there we would have hitchhiked to Verdon, the climbing mecca in those days. A unique chance presented itself, the La Sportiva van was heading for Bardonecchia where the company was going to meet many of its sponsored athletes. The owner was driving that van, for me he was Lorenzo, he had no surname. Maybe his position instilled trust in my parents and my mother took me to the Verona Sud motorway toll. I was bubbling over with excitement as I saw that blue van with the huge writing La Sportiva on it, and I smiled as my mum ‘handed’ me over to a business man who in her eyes must have had a strange appearance: a big, smiling, jovial guy wearing shorts and a yellow vest. During the eighties the highway code was adjusted by us with a bit of flexibility and depending on personal needs. Lorenzo drove and Luisa Iovane sat in the passenger seat, there were no other seats. So the kid - that is me - had to sit in the back. I lay on top of big boxes with climbing shoes inside and on top of the box were all the names of those climbing legends who made me dream so often: Glowacz, Raboutou, Cortijo and others. Lorenzo told me - as if it were normal - that these were not normal production climbing shoes, but prototypes of new models which had to be tested. Amazing. At that moment my uncomfortable seat in the back of the van was a lot more than I could have ever hoped for. I peeked into the boxes, I could see and I could touch the shoes with completely new colours compared to the ones seen in the mountains a short while before. Those turquoise and fuchsia-coloured Mega shoes shone even brighter, matching my mood. And that first rubber band which ran right round the whole shoe which was becoming a Kendo filled me with astonishment and made me dream of a future to devour. Every now and then I would look into the cabin of the van and I would listen to Lorenzo talking of shoes, climbers, of new meetings, of ideas for the future. In his tone there was a familiarity which fascinated me. I dreamt of that world and I felt actively part of it, even if I was still in my painful prison-school. All those conversations acted like wind to my fire. And towards the person with whom I was having these conversations I felt a mixture of reverential fear and a certain empathy. Once we got to Bardonecchia, I could see the great relationship Lorenzo had with his climbers and with what passion he delivered his climbing shoes, but could not imagine that twenty or so years later I would be the person often driving those vans and be the one to relate to our athletes. In the days to come I created a more precise identity which no longer needed legends, on the contrary it downsized them and I matured an attitude which became impervious to the sector’s companies. I had a romantic soul, and I did not like the idea of being sponsored simply because I feared spoiling in some way the love I had for climbing and for the mountains. I did not want any external pressures, even if I was unaware of them, that could even slightly undermine the freedom of my thinking and the intimate dimension of my climbing. This is why I chose to become a Mountain Guide and after years of work in a close-knit group, it had become clear to me that professionally I could only move in two directions: either on my own or as part of a team with whom I strongly felt the human side, familiarity and the possibility to share a certain vision of the world. One day my phone rang, the name Lorenzo La Sportiva came up on the screen and I heard his usual great attitude with an added official tone this time. He said he had thought of me as the right person to maintain and look after the relationships, from all points of view, between the team of athletes and the company. Honestly, didn’t I want a job and not only a sponsorship? Well that would have been my chance. «If you want the job you’ve got it and it would really make me happy if it were you, think about it for a week and then let me know». Ten years as a Mountain Guide had softened me and helped me accept more tempered advice. I accepted. I signed my first work contract for the company and it was Lorenzo who accompanied me side by side during the first period to teach me, or better to pass on, the sense of my role. So, there I was for the first time in Val di Fiemme, loading the La Sportiva van to go as official sponsor to the Rock Master. Lorenzo joined me there, at the stand which was already set up and ready, and I would share that space with him for the following two days. I was restless, not so much for his presence, but for my own, because I still had so many doubts on my actual ability to resist inside a company, since I had been spoilt by having had lots of free and anarchical periods of time. That time in Arco one of my friends ‘il Canon’ Luca Zardini took part in one of his last Rock Master competitions, he had fought for years like a lion even against athletes who were a lot younger than him and for this reason he had become one of the meets’ favourites. 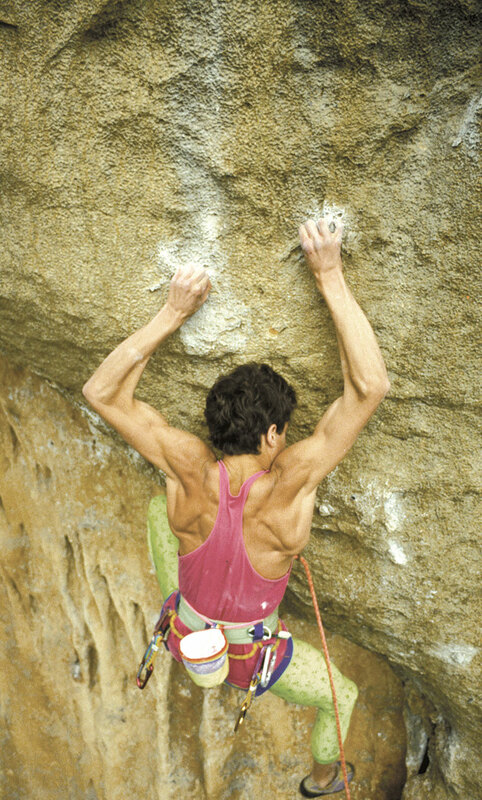 His was a fantastic climb, both for him and for the entire audience. It was as if everyone felt the effort not only of the current moment, but of a lifetime. There was unbelievable cheering and when he fell, everyone exploded and stood up, goose bumps and more cheering. While Luca was being abseiled back down and waved to the crowd, by chance I turned slightly towards Lorenzo. While he finished cheering, I saw him take his sunglasses off, his eyes filled with tears. Yes, I really did want to work for that company.